SpaceX's latest landed booster survived its ocean journey without toppling over and has now joined its three companions in the company's reusable-rocket repository. On May 27, the first stage of a SpaceX Falcon 9 rocket helped launch the Thaicom 8 commercial communications satellite from Cape Canaveral Air Force Station in Florida, then came back to Earth on a robotic "drone ship" stationed a few hundred miles offshore in the Atlantic Ocean. The successful touchdown used up the energy-absorbing "crush core" in one of the Falcon 9 stage's four landing legs, causing the booster to tilt noticeably on the ship's deck. 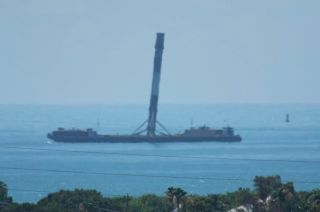 At the time, SpaceX founder and CEO Elon Musk expressed a bit of concern that the booster might tip over during the lengthy trip back to shore at Port Canaveral, even though the rocket was welded to the drone ship's deck. But everything turned out OK.
"Yay, baby made it home!" Musk said on June 3 via his Twitter account, @elonmusk. The booster has since been transported to a hangar at Launch Complex 39A, which is part of NASA's Kennedy Space Center. The building now houses all four of the Falcon 9 first stages that SpaceX has brought back to Earth during orbital launches. The four Falcon 9 rocket first stages that SpaceX has landed sit in a hangar at NASA's Kennedy Space Center in Florida. "Fantastic four," SpaceX tweeted yesterday (June 6), along with a photo of the four rockets, which are part of the company's effort to develop fully and rapidly reusable launch systems. The first successful Falcon 9 landing occurred in December, during the launch of 11 satellites from Cape Canaveral for SpaceX customer Orbcomm; the Falcon 9 first stage came back down on terra firma. The Falcon 9 that landed in December will go on display at SpaceX's headquarters in Hawthorne, California. But the company aims to refly the booster from the April 8 launch, perhaps as early as this summer, Musk has said.